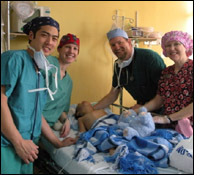 I traveled with the Ecuadent Foundation on their February 2010 medical mission to Ecuador. Our mission took place in the public hospital, San Vicente de Pa�l, of the town of Pasaje. Our medical team was composed of about 30 volunteers, which included three plastic surgeons. Over the course of 4 operating days, our team provided free surgeries to 53 people (49 children and 4 adults). Thirty of the surgeries were corrections of cleft lips and palates. The rest of the surgeries included corrections of burn scar contractures, polydactyly and syndactyly. We also had a speech therapist travel with our group who completed 55 speech therapy sessions. Most of my time was spent in the PACU addressing issues with post ansethesia recovery. These ranged from providing minimal amounts of oxygen and simple positioning to actively providing positive pressure ventilation. In addition I monitored the palet repair for post operative bleeding. We heard many heartbreaking stories from some of our patients. One mother of a child with cleft palate shared that she was told that the child's congenital deformity was her fault as she had gone outside while pregnant during a full moon. Many stories, however, were also heartwarming. One of our patients was a 40 year old man who had had a cleft palate his entire life. He was a fisherman and also a preacher (as he siad "a fisher of people". Our team was able to surgically correct his cleft palate.